This 2 days maybe your last working day and if you don't feel the CNY mood yet, probably the surrounding will giving you the feel more or less and telling you the day is getting near. The morning market is getting lots and lots people and many CNY things selling, the traffic near shops was slightly jam pack and many temporarily tents setup at roadside selling the must have mandarin oranges. Counting down to 3 more days, what else I'm doing...yesterday and today will be doing some last round of minor cleaning on bedroom, kitchen, toilet and hall, washing the bedsheets, towels and rugs. If can't finish also will close one eye, my back has been feeling sore these days due to carry and pushing heavy stuff (it also affected my sleep) or it may be due to other reasons, not really sure. Supposed the part-time cleaner will be here to do the final part cleaning, but her booking is full, so got to do myself. PEDICURE. Don't laugh at me, this was actually my first time visits nails studio and properly letting people wash my leg and feet, got scrub and trim my toes. I also put on nail art. Got it done at Be Nails in Endah Parade. It cost me RM60 - RM48 is the Basic pedicure (using better lotion for my dry skin) and RM12 is for nail art, took 1 hr 15 mins for doing it. I walk-in at 10.20am and it was already full house. Luckily a girl just finish and I got my place before the next appointment customer. Also today is the only day I'm free after sending Terry to school, if can't make it - thats it. I'm glad I have make it, now my feet can leng-leng on this CNY. Since last 2 weeks, Terry's kindy was introducing them about Chinese New Year during the Thematic session. They have been singing CNY songs and learning all items related to CNY. He sure can feel the season by now and have been practising Gong xi-gong xi. These are the art works they did with lots of help form teacher. From the school, the principal also very thoughtful sending us a card and a gift pack for the kids today. The CNY programmes on TV Astro is nevertheless that attractive and many interesting topic and movie to follow. Every year I don't have the chance to watch it after going here and there, for this year same too. We will be going to Ipoh for 2 days staying in hotel, at the same time visit my mum's side relative uncles and aunties. Mum's side relatives having the largest group of people about 80+, if were to gather everyone up. Both of my maternal granny already not here. On the 2nd night we will be having BBQ dinner. Down into memories, the last we have this big family BBQ was more than 10 years ago. I think this should be my last post before the CNY holiday. Just in case I'm not write again, here wishing my Chinese friends, readers, bloggers and family have a very HAPPY and PROSPEROUS NEW YEAR with abundant blessing on health and wealth. and to non-Chinese Happy Holiday to you. Remember to be safe on the road and everywhere you go. Wow...pampering yourself with a nice pedicure. Very nice nail art. :) Terry's CNY crafts are really neat and nice. So good got CNY goodie pack too. 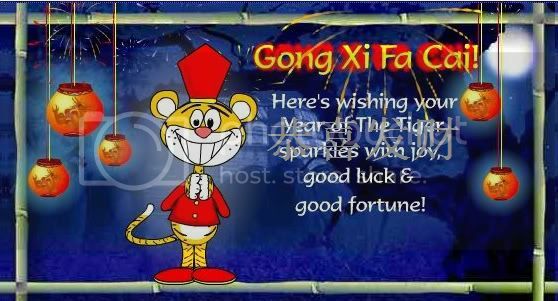 Enjoy your CNY and Gong Xi Fa Cai to you and your family!!! Your toenails are very nicely done up :-) Wishing you and your family a very happy Gong Xi Fa Cai! Your toes so cute lah, like a baby toes, the art nail is nice. Hope we can meet during cny! Gong Xi fat cai. Very nice color & pretty toe nails. Gong Xi Gong Xi. Happy Tiger Year & Happy Valentines. nice pedicure, good price too. hmmm... now i know endah parade also got nice nail salon yea, a fren told me sri petaling the shops there got one, 1st trial customer get really good price! Judy, u have really small cute feet :) I thought it was a child's feet hehehe! Terry's school is nice to build up the CNY mood for the kids! Anyway, your nails look nice! hehe....Judy, so cute and pinkish your toes!